In stock -This product will ship today if ordered within the next 2 hours and 5 minutes. The gentle, natural solution to remove head lice and nits. No chemicals or pesticides! This Head Lice Kit includes a strong, stainless steel comb with long teeth, finely spaced to trap nits and removes them from the hair shaft. 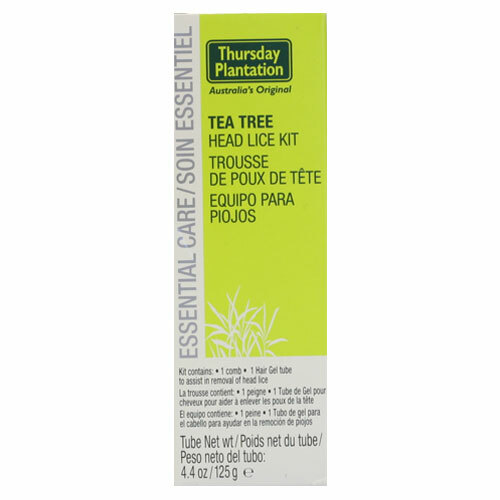 Thursday Plantation Head Lice Kit contains a clear Tea Tree Head Lice gel to easily identify and cover nits and head lice and a specially designed comb with stainless steel, cylindrical teeth to gently eliminate nits and head lice. The thick gel encapsulates the head lice and nits, making it easier to remove them using the fine toothed comb. No mess, no drip gel to avoid run-off into children`s eyes. Gel contains 100% Australian Tea Tree Oil. Thursday Plantation Tea Tree Head Lice Kit - 125g. Comes with comb. Aqua / Water, Alcohol, Polysorbate 60, Melaleuca Alternifolia (Tea Tree) Leaf Oil, Carbomer, Potassium Hydroxide, Tocopheryl Acetate. Directions: Do not leave children unsupervised. Brush hair to remove knots. Apply gel to dry hair, ensuring scalp and hair are completely covered. Leave gel in hair for 20 minutes and then rinse in warm water. Wipe combings onto a tissue. Rinse comb in warm water after each comb through. Continue until no lice or nits are evident in combings. When complete, rinse hair. Repeat the above process in 7 days. If concerned about sensitivity, apply ½ teaspoon of gel to forearm and rinse after 20 minutes. If irritation occurs within the next 24 hours, do not use this product. Always read the label. Use only as directed. For external use only. Avoid contact with eyes. If contact occurs flush eyes with cold water. Do not use on children under 6 months of age without medical advice. Gel contains plant derived alcohol. Below are reviews of Thursday Plantation Tea Tree Head Lice Kit - 125g by bodykind customers. If you have tried this product we'd love to hear what you think so please leave a review. The gentle, natural solution to remove head lice and nits. No chemicals or pesticides! This Head Lice Kit includes a strong, stainless steel comb with long teeth, finely spaced to trap nits and remove them from the hair shaft.